At Sharper Uniforms, we pride ourselves in being able to offer you the highest quality hospitality wear. Part of that is making sure that everyone on your staff looks their best. If you�re running a casino, you need to make sure that the women on your staff look just as put-together as the men. It�s not enough to have high quality collared shirts and tuxedos shirts for men�and that�s why we carry a great line of shirts and blouses for women working in the casino industry. Our ladies casino shirt looks great tucked or untucked, and the design choices are all yours. You can add your own personal touches to the shirt, so your casino can look as unique as you want. 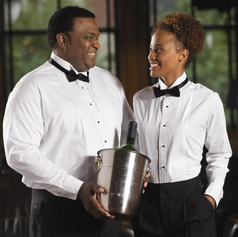 When you want the ladies on your casino staff to look their absolute best, look no further than the great collection of collared shirts, tuxedos shirts, shirts and blouses here at Sharper Uniforms.